Listen to the audio version of this story as it aired on Indiana Public Broadcasting stations. 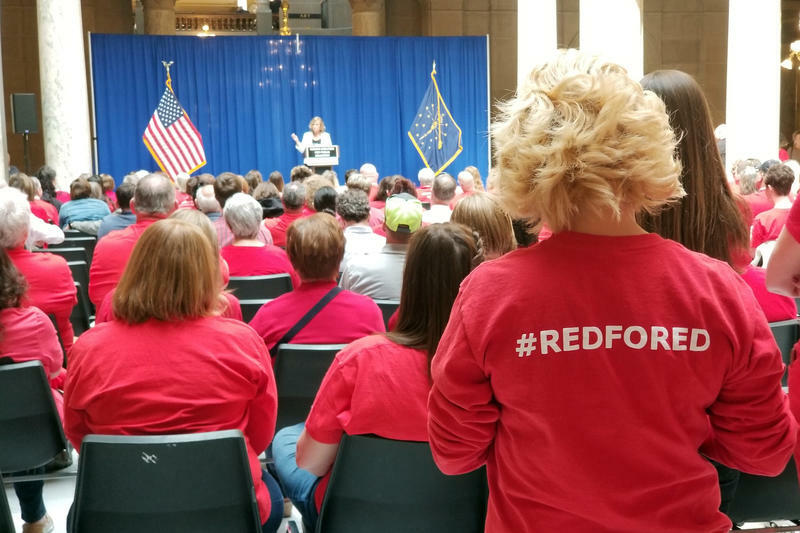 While lawmakers in the Senate decided the fate of several bills Tuesday, a group of public education advocates wearing red gathered downstairs. 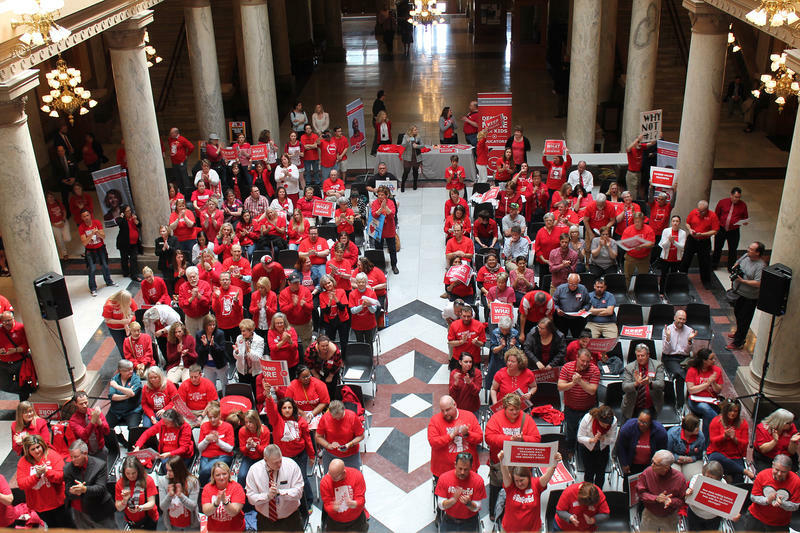 Teachers unions, the Coalition for Public Education and Indiana PTA helped organize the event as a near-final push for more money in the state budget as the legislative session winds down. Superintendent of Public Instruction Jennifer McCormick is Indiana’s last elected schools chief, and she told the crowd it’s more important than ever to keep the pressure on elected officials. “It is time we start asking our state, federal our local officials ‘where are you on teacher pay?’” McCormick says. Sen. Eddie Melton (D-Gary) echoed her statements, saying advocates need to continue asking more of policymakers. He, and several other lawmakers at the rally say education funding and teacher pay need to be the top priority. Public educators have lobbied lawmakers to boost school funding by 3 percent each year of the state budget, but budget proposals so far keep school funding increases a little more than 2 percent each year. They say it’s vital for improving teacher pay. The Republican supermajority has so far resisted plans to send dollars directly to teachers. Many say requiring dollars to go directly to teachers would limit districts’ ability to maintain local control. Lawmakers will work to finalize the state’s two year budget by the end of next week.